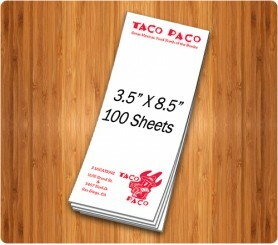 3.5 x 8.5 Personalized NotePads -We offer 3.5 x 8.5 Personalized NotePads that fit your every unique requirement. 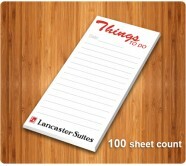 From 3.5”x4.25” to 8.5”x11”, custom printed notepads are available in various sizes and styles. Prices include one (1) to four (4) color imprint including full-color (four color process) on one side, and up to 30 minutes of art setup time. Exact color matches, metallic or fluorescent colors cannot be printed in full-color (four color process). Image bleeds are not available on note pad orders. Color of product is white. Material is 50 lb. offset only, with white 12 point backer card.